Freezing fresh green beans is a quick and easy way to preserve them for later use. 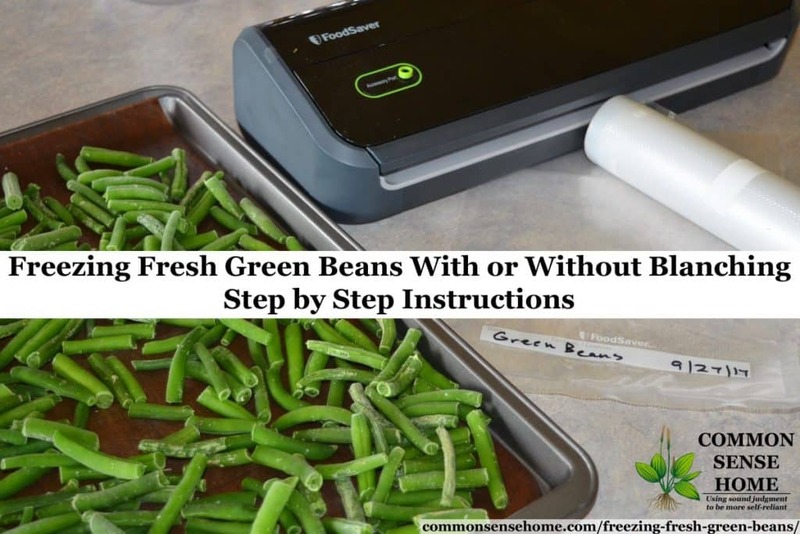 We'll walk you through how to freeze green beans, step by step, with or without blanching. Whether you're freezing pole beans, bush beans, yellow beans or other snap beans, the method is the same. You need about 1-1/2- to 2-1/2 pounds of green beans per quart of frozen beans. 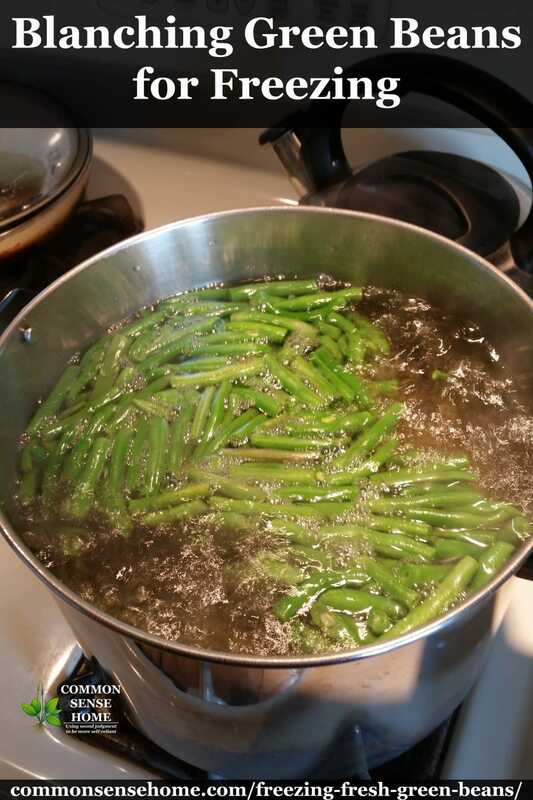 When I'm freezing green beans, I prefer to blanch them, but many people don't bother to save time. It's up to you. I do recommend washing your beans before freezing. Even if you garden organically, contaminants drift in on the wind. After washing or blanching, make sure to dry your beans well. Excess water means more ice crystals in your beans. I spread my beans on a kitchen towel and pat dry, or use the salad spinner. 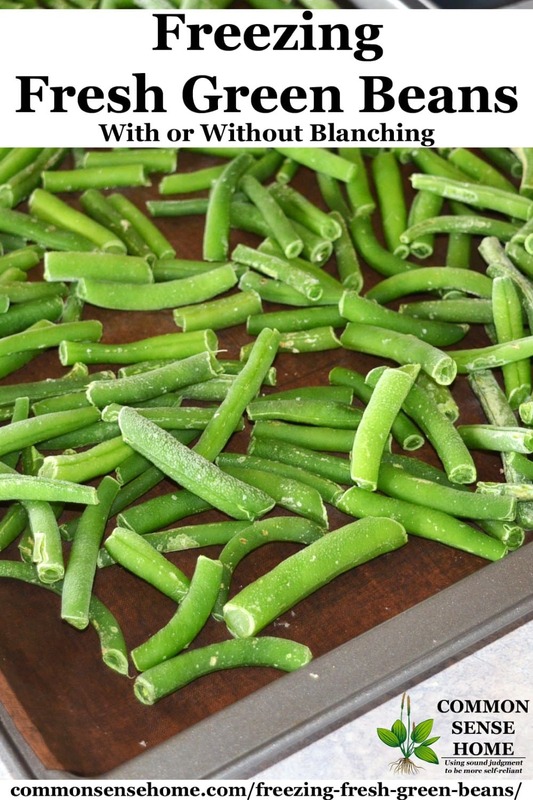 Blanching green beans for freezing reduces enzyme action and helps to preserve vitamins in the beans. 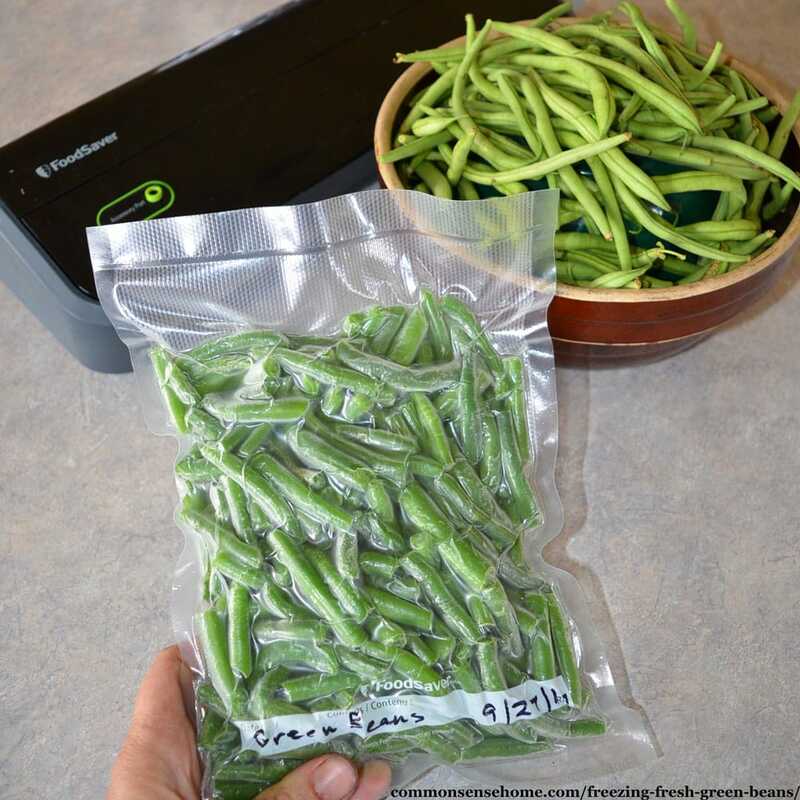 I also flash freeze and vacuum seal my green beans for ease of use and best storage quality. If you flash freeze your beans (freeze them loose on a pan before packing them in a bag or container), they don't stick together so much in the bag. This makes it easier to pour out only what you need. Even though I generally use a whole package at once, it's nice to pour out loose beans instead of a “bean brick”. During the growing season, pick green beans every two to three days to keep them producing. Look for beans that are full sized but not overgrown. Runty green beans get limp, and overgrown green beans are stringy and tough. My sons prefer to cut the ends and beans with a knife on a cutting board. I prefer to snap the beans by hand. Either works just fine. For freezing green beans, you can leave the beans whole with the stem cut off, or cut/snap into bite size pieces. 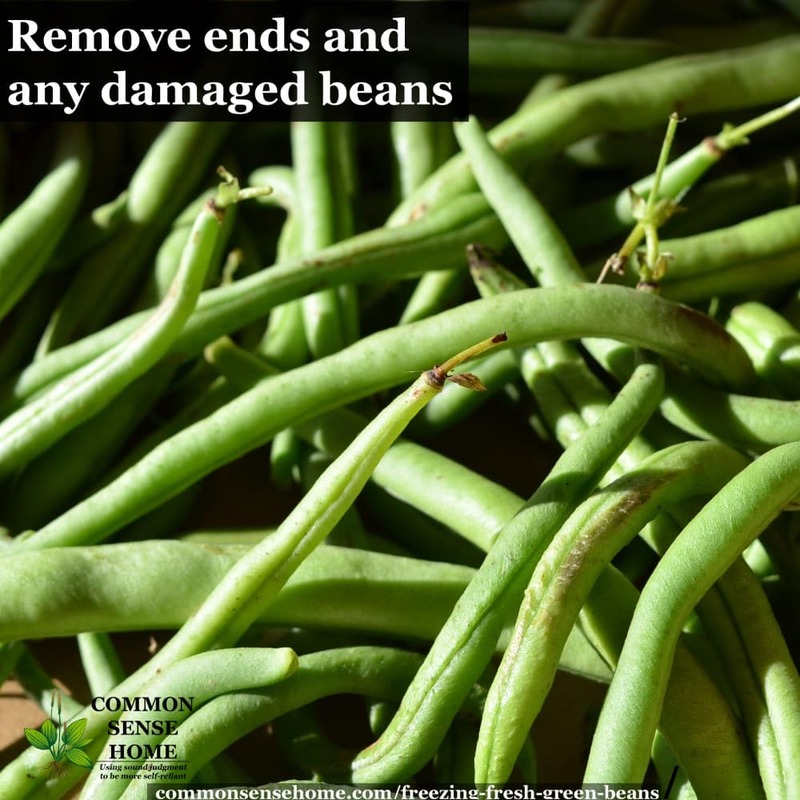 See “How to Grow Lots of Pole Beans for Easy Picking and Preserving” for green bean growing tips. Vacuum sealer shown in the post – FoodSaver FM2000 – I've had some issues using the hose attachment for this unit, but for basic bag sealing it works just fine. It has a wide sealing surface and still seals even with damp foods. It's a good basic unit for bag sealing. Razorri E1800-C Vacuum Sealer Machine Automatic Vacuum Sealing System – well reviewed on Amazon and inexpensive. Has some issues with seal reliability for damp foods, so if you opt for this unit, make sure to freeze your beans before vacuum sealing. FoodSaver 8″ roll, BPA free, cut to size – I've tried “bargain” brands of vacuum sealer bags and was not impressed – too many seal failures. I'll stick with FoodSaver bags/rolls. The rolls let you cut to size, the bags are ready to go right out of the box. If you do a lot of vacuum sealing, Amazon also offers a “subscribe and save” option for 20% off your order. FoodSaver Quart Bags, BPA free – Ready made bags for ease of use. Wash green beans in cool water. Drain well. Trim off ends of beans, snap or cut to desired length. Pack green beans into freezer bags and squeeze out as much air as possible. Lay bags flat in a single layer for quick freezing. Once frozen solid, you can back the bags into a bin or larger bag to keep your freezer organized. Use within a year for best quality. Wash green beans in cool water. Trim ends and cut to desired length. Bring a large pot of water to boil and fill a large basin or bowl with ice water. Working in small batches, lower beans into boiling water using a large slotted scoop or wire blanching basket. Remove beans from boiling water and dump them into the ice water to stop cooking. Cool beans completely. Stir and add more ice if needed. Drain beans and dry well. I either run mine through our salad spinner or pat dry on a kitchen towel. Pack beans in freezer bags as above, or flash freeze green beans on a lined cookie sheet for a few hours or overnight. 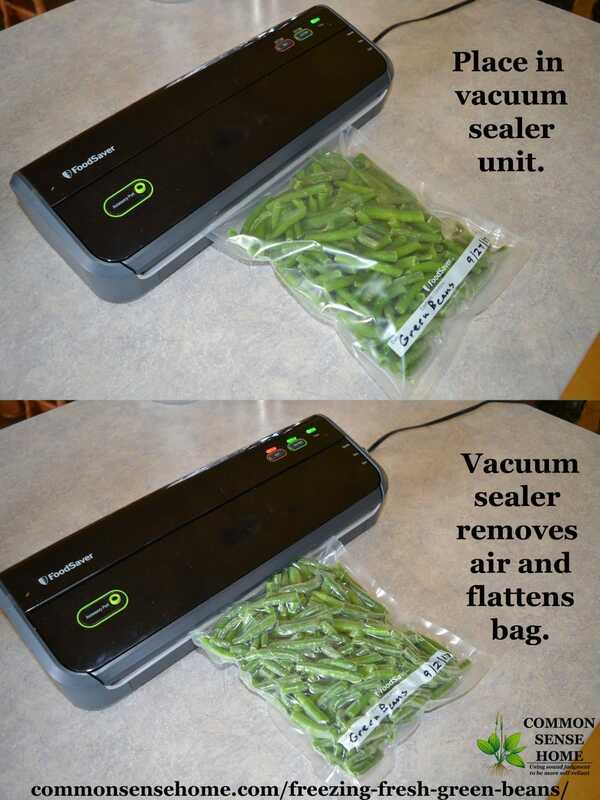 Pack flash frozen green beans into labeled vacuum sealer bags. Vacuum seal and store in freezer for up to two years. Can You Freeze Cooked Green Beans? Do you blanch your beans before freezing, or skip this step? I've always been a blancher, but I have friends who don't blanch. Did you know we have an extensive list of canning and preserving recipes and guides? You can see the entire list on the Recipes and Kitchen Tips page. We always follow safe food preserving guidelines. Sometimes it's fine to take shortcuts, sometimes it's not. I love yellow and green beans. I have blanched and flash frozen them and then vacuum sealed them with my Food Saver. I cook them from frozen in my steamer but find they just don”t taste as good as when cooked fresh. I would like to know if fresh beans can successfully be frozen in water, without blanching, for storage. It’s not how they are normally done, but you can certainly try it and see if you prefer the results. Try boiling your beans when it’s time to eat them. I find they often need a little bit of rehydrating, which steaming doesn’t provide. overwhelmed with green beans this year, my husband does not like them blanched, ok to just freeze? As discussed in the post, I prefer to blanch, but it’s not essential. If your husband eats them better not blanched, that seems like a reasonable choice.